There is a common misconception that Mick Taylor (John Jarratt) was a real person. In fact the character was created from the stories of Australia's most heinous criminals. While the crimes themselves are real, they were committed by a variety of people, not just one man. What made both films work, was the character of Mick Taylor, who while being a horrific serial killer, was still very likeable. Taylor is charismatic and most important of all very funny, and audiences in 2005 ate it up. After the success of the first film, a sequel was immediately planned, but put on hold due to the fact that some of the crimes portrayed in the film, were still being prosecuted in court. The legal issues delayed the film eight years and kept it out of theaters, which is a shame because it was better than the first and received almost no exposure. 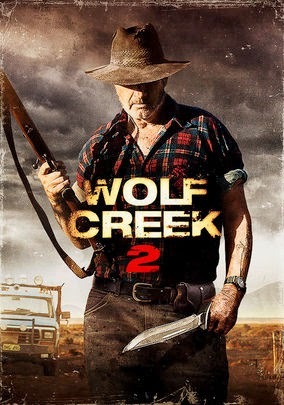 In the second installment of Wolf Creek, Mick isn't just torturing victims at his dungeon, he's chasing a man through the outback, and when they finally meet, they come to discover that they aren't entirely dissimilar from one another. Ryan Corr (Saw 3D) plays the runner and is just as witty and entertaining as Taylor himself. The chemistry between the too was terrific and gave the series a whole new dynamic, which elevated it to another level. Wolf Creek 2 is so much more intense and at the same time comedic, compared to the first film. It was definitely a risky move by Writer/Director Greg McLean, that really pays off. The Wolf Creek films are no different and no less predictable than any other slasher film. What makes them unique is a character that encompasses the personalities of multiple serial killers and gives the audience the rarest of bad guys, the one that you root for. Even if you don't like slasher films, you may enjoy John Jarratt's extremely strong performance and get a few laughs in between the carnage.